The scene, a local cruise night: Another '69 Camaro, another '57 Chevy, another '66 GTO, a '29 FrankAubilllac, another '66 Mustang...wait, a '29 what? FrankAubillac? What the... I love it! How do you build one? First of all, you are going to need a chassis. All good hot rods start with a solid chassis, preferably one with commonly available parts. May we suggest a 1929 Franklin 135 with an air cooled, overhead valve, Fox engine? With the Fox engine, you won't have to worry about things like radiators and winterization. Of course, you had probably guessed we would recommend the Franklin/Fox combo. Next, you'll need a basic body. A roadster is a classic choice. 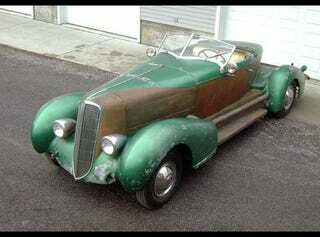 Most wrecking yards will have a correct '28 Auburn Boattail Speedster squirreled away out back. Grab that, and the fenders from a '35 Cadillac. They say the devil is in the details, so you'll need some shiny bits. While you are at the wrecking yard, grab a '36 Studebaker grille, some '38 LaSalle taillights, and maybe some headlights from a '36 Pontiac. Now that you've gathered the necessary parts, take them home, mesh them all together into a transcendent expression of art and of self. For those finishing touches, we suggest some sort of animal print for the interior panels - say leopard. Finish the body with high-quality lacquer base and barnacle-resistant, copper highlights. Of course, it only makes sense to stash it in an airport hangar with its volitant, air-cooled cousins. A few words of advice: Once your FrankAubilllac-amino (kidding, not -amino) is done, take it to cruise nights and weekend shows. However, in the interest of appearing original, be careful not to show up at the same event as Homer Marshall's FrankAubilllac, which he built in the early '50s. Also, it may be prudent to note that Homer's car was shunned by both Franklin and Auburn enthusiast clubs, so you may want to avoid them as well. Anywhere else you'll be a hit, and nearly perfectly unique. This piece was written and submitted by a Jalopnik reader and may not express views held by Jalopnik or its staff. But maybe they will become our views. It all depends on whether or not this person wins your vote in the second round of our reality show, "Who Wants to be America's Next Top Car Blogger?"